This is an article about Chinese business culture based on my own experience with real examples, even demonstration with real e-mails. Before venturing onto my import-export adventure I wanted to understand how Chinese people did business and I read a lot of stuff about meeting them, greeting, exchanging of business cards, communication style, differences and other rules of etiquette. Some people talk about the need to negotiate with them, others talk about some spiritual beliefs that Chinese people have, but not many seem to give real examples and most of the information seemed to be so vague and generic. So, this information will prepare you for the REAL business with the Chinese, which is a lot of hard work, I warn you. Be sure to roll up your sleeves. Months ago I learned a bit about anti-ageing devices. I found the whole thing so interesting that I decided to explore some business opportunities. Why don't I import some stuff into the UK and try to sell it here? Chinese stuff should be cheap, so who knows maybe there is an opportunity for profit!? With tools such as alibaba.com being so easily accessible, who stops me from exploring? I looked at a few items, made a list of some beauty devices that I found particularly interesting and started contacting suppliers. What are the results? So, you want a better price for your order of larger quantity? Sure! Ok, 20 units cost $3 per unit. You want 200!? Then it will cost you $3.5 per unit! How is that? Do you like my offer? Off course, I am very flexible! I'll give you the best price! It was $100, now my best price is $100! How about that? How many do you want? Ok, I'll sell for $3 per unit for a quantity of 1000. Oh, you sound interested! How about $3.5 per unit instead then? Oh, you actually remember the price that I offered before! Ooops! - How much is a derma pen? 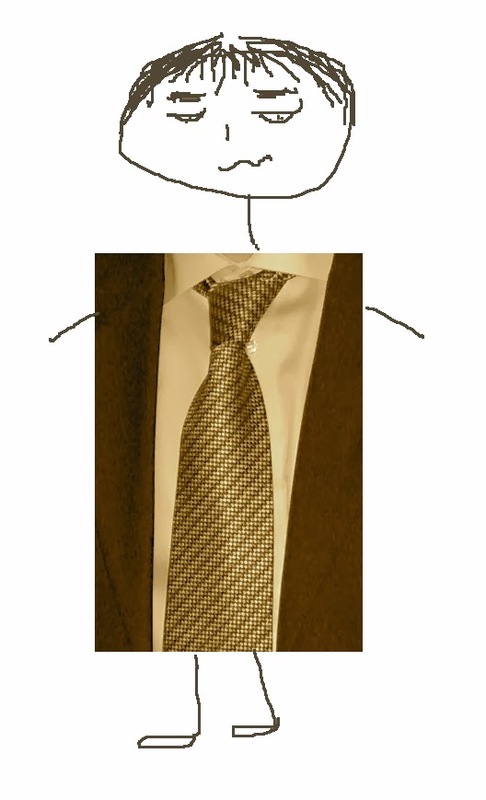 If you'd like some real life illustrations, then carry on reading, otherwise, jump straight to the conclusions. Obviously, I can't complain about it being funny, this is probably the best part in this whole process. So, it's is an upside. Now let's go DOWN the hill this time. After having read a few articles on how to deal with the Chinese and about their business and negotiation culture I decided to follow the advice and started negotiating. I have three real examples of how it all went. The beauty device costs US$100 if buying one unit, US$98 if you buy 5 units and US$95 if you buy 10 units. Minimum order quantity is one device. All right, it doesn't sound like there is a point in buying more than one unit given that the price difference is so small. Anyway, I am not interested, because, having added all the costs associated with import, transport and selling, there is no way I can make any profit. 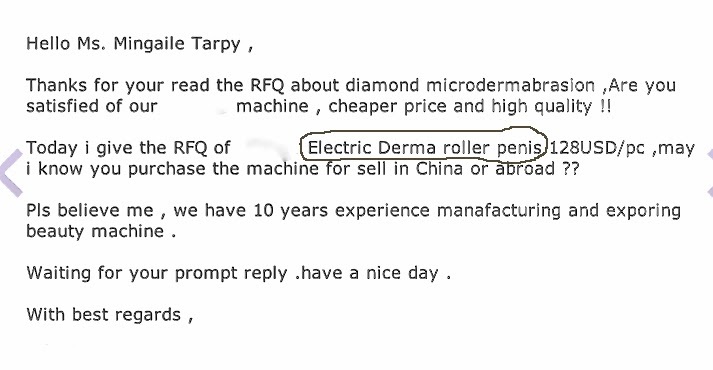 Nevertheless, the Chinese seller won't leave me alone. Every day he kept sending me e-mails and made Skype phone calls and messaging. As soon as I logged in to my computer I got a Skype call or at least five messages saying 'hi, how are you? are you interested?' and so on. The salesman sounded keen as mustard. Eventually I decided to give in: 'if you can give me a better price, maybe I can reconsider buying those devices from you'. I enquire again asking for the best price possible. He promised to send me his bestest price by e-mail. Great, he promised to give me a better price, in fact, he promised to give me his bestest price, but he gave me exactly the same price!!! In order to do business I obviously need to think of some marketing strategy. One of the ideas that came to mind was to give away some freebies to certain people. The product for giving away needs to be cheap as I can't afford to give away things that cost a lot for free. One of the cheaper products that I liked was a derma stamp, just a small one with a few needles on it. So, I started enquiring. Usually, minimum order quantities start from 50 or 100 units for derma stamps, sometimes you can find as low as 20 units, so for my marketing I needed at least 1000 to start with. The order size is quite a bit larger than the minimum quantity, so I thought I might be able to get some discounts. That sounded absolutely fine. I would need some derma rollers anyway, so, I'm all chuffed! After exchanging another few e-mails about all the details, I decide to place an order. After I place my order I receive a response not from Maria, but from Kristy. Ok, Maria has left the company, Kristy is taking over and she is not aware of what's going on. I explain all the details to Kristy, forward the evidence of all our communications with Maria. What could possibly go wrong? Everything is in writing. Ok, it all smells like rat again. First of all, you said that the price was incorrect. Now you are obviously lying to me that there is no such device with 10 or 12 needles on the market, but you go all quiet when I send you the evidence that there is a derma stamp with 12 needles in your own company! Anyway, there was silence for a little while until I got an e-mail from Maria. She has not left the company after all! So at this stage, regardless of how amazing the price could be, do you think I would still want to deal with this company!? Not me! This is one of the other manufacturers that I contacted about the 1000 units of mini derma stamps for my marketing purposes. 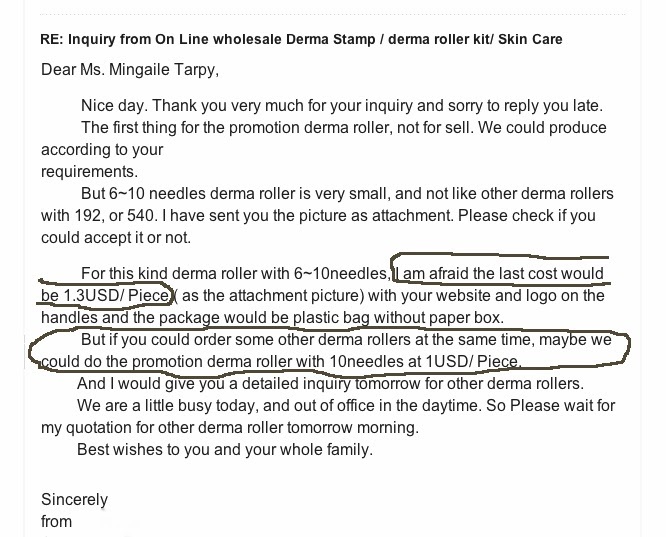 This manufacturer said to me that they could make me 1000 units of mini derma stamps for US$3 per unit (bear in mind that $3 is also the price per unit when ordering minimum order quantity of 50 units), but it would be a lot cheaper if I wasn't fussed about the packaging. Well, I am not fussed about the packaging, I am fussed about the price! We exchanged a few more e-mails, then the saleswoman said that they would not be able to achieve my desired price. Ok, no problem, I said, just tell me what is the price that you want for something with the minimum or no packaging. The Chinese woman thought that I sounded eager, so she came back to me saying that they would do 1000 units for US$3.5 per unit with perfect packaging. All right, that's more than everybody else charges for 50 or 100 units, including yourselves! Dealing with Chinese people is very time consuming, so if you don't have a lot of time, find a better business opportunity. Not sure if negotiating the price is such a good idea. Unlike the advice I read on some other websites, my personal experience in negotiating the price was not good. If I do any business with the Chinese again I will be more willing to take the offered price or reject it without negotiation. I realised that with two small kids I just don't have enough time to run business involving Chinese. Their culture is not something I understand. Any advice I read on other websites about how to deal with the Chinese and their business culture, obviously, did not work for me. That whole spiritual thing that everyone talks about is also beyond my understanding. I didn't see anything spiritual there. Anyway, I am not saying that I will never deal with the Chinese again. I am just saying that this business is not for me at this stage of my life. If a cake costs $5, I don't expect the price to go up to $10 as soon as I get my purse out. Have you ever dealt with Chinese? If so, did you have positive or negative experience? Have you ever thought of having your own business? If so, what would it be? Should I Give Up On Facial Rejuvenation?